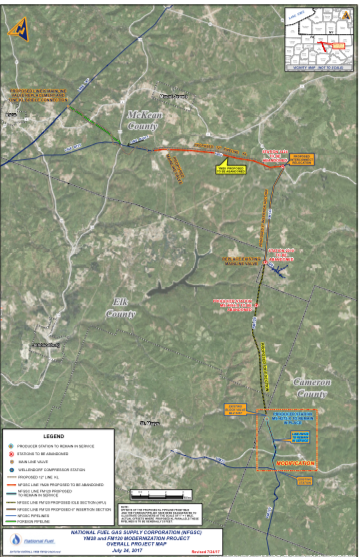 FERC has approved National Fuel Gas Supply Corporation’s request to conduct non-mechanized tree felling between mileposts 0.0 and 1.2 only of the western portion of Line KL as a part of the Line YM28 and Line FM120 Modernization Project. According to FERC’s David C. Swearingen, trees must be felled in a manner so as to avoid obstruction of flow, rutting, and sedimentation of wetlands and waterbodies. Swearingen added that downed trees must be left in place until applicable subsequent construction is authorized. Once completed, the project will enhance the reliability and safety of National Fuel’s system, allow for continued transportation services performed by the abandoned facilities, and offer better connectivity for storage and transportation services to National Fuel’s Line K Pipeline. It is expected to be placed in service in November 2018.